Fall is a magical time at La Ciau del Tornavento. 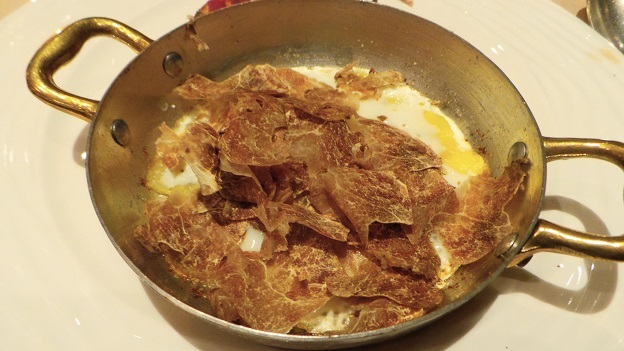 White truffles abound, the wine is plentiful and the room buzzes with energy. Proprietors Maurilio Garola and Nadia Benech and their team were at the top of their game both times I visited La Ciau recently. I can’t think of too many better ways to start dinner than with a glass or two of Bollinger’s 2002 Vieilles Vignes Françaises. The 2002 has lost just a touch of the youthful exuberance it exhibited a year or two ago, but it is still compelling for its superb textural balance and overall sense of resonance. Anselme Selosse’s NV Aÿ La Côte Faron is super-refined, floral and lifted, with striking purity of fruit and terrific harmony. Two totally unique Champagnes side by side. What a great way to start dinner. Bruno Giacosa’s 1975 Barolo Riserva Speciale Bussia di Monforte is a revelation. I have never had good luck with this bottling in the past. Maybe it was just a matter of time. Although fully mature and perhaps on the back end of maturity, the 1975 is hauntingly beautiful. The fruit is sweet, candied and perfumed in a mid-weight, totally gracious Barolo. From what I have been able to piece together, the 1975 Bussia di Monforte was made from Pianpolvere Soprana, a vineyard Giacosa regards as the single best site in Barolo. The 1967 Barolo Riserva Speciale Collina Rionda is even better. Wonderfully pliant and resonant for a wine of its age, the 1967 is a real head-turner. Here, too, the fruit is almost impossibly sweet, but there is more depth and nuance to the flavors. What a treat it is to drink the 1967 Rionda on this night. Giacomo Conterno’s 1970 Barolo takes things into the stratosphere. Savory herbs, ferrous notes and sinewy tannins are the signatures. A powerful, tannic wine, the 1970 is simply magnificent. A few months ago, I tasted the 1970 Monfortino and was similarly impressed. But the 1970 Barolo needs no comparison. It is stunning on its own. The 1993 Barolo Riserva Monfortino is an unexpected addition to our lineup. Exotic and perfumed, the 1993 possesses marvelous depth and personality. This may very well be the best bottle of the 1993 I have ever had. The flavors are just popping. I am indebted to two Vinous readers sitting next us for sharing such a special bottle of wine with us, but then again, the world’s best wines have a way on inspiring generosity. Truffles are plentiful on this night. The Poached Egg with White Truffle is fabulous. How could it not be? 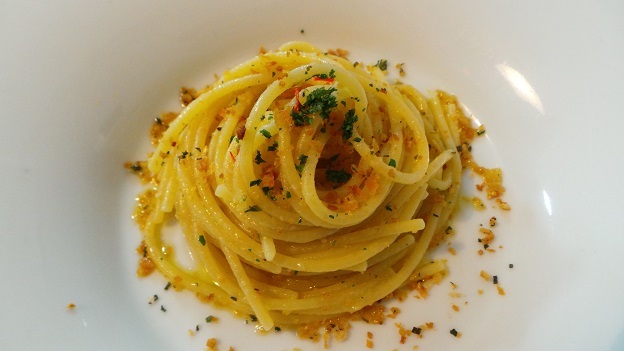 La Ciau’s 28 Egg Yolk Tagliolini with White Truffles, a signature dish, is absolutely decadent. 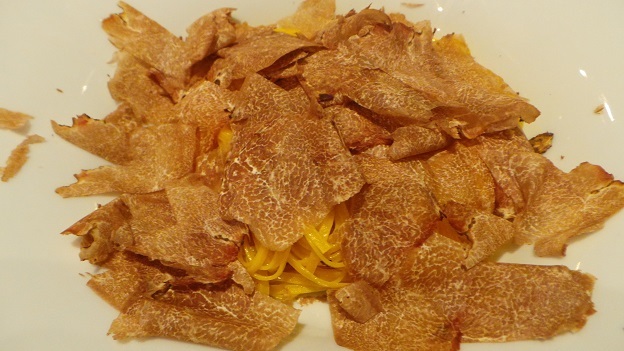 When it comes to white truffles in Piedmont, there is no such thing as too much. The roasted capretto (kid) is tender and moist, yet also full of flavor. I have ever had. As good as the 1988 is, it can’t match the sheer joy of sharing so many special wines with a small group of close friends.